AUSTIN, Texas — Even at a young age, Ralph Gilmore knew his way around the kitchen. "I was probably 11 years old when I cooked a full turkey dinner with all the trimmings and mom came home and she was blown away," he said. His buddies caught onto his culinary skills, and pretty soon, everyone in his Brownsville neighborhood wanted in on the meals. "We had the barbecue pits and all the friends down the street would just steal their mom's meats and we'd just laugh," said Gilmore. "Let's just grill this stuff up. Mom will be mad for a minute." These days, you'll find Chef Gilmore behind the grill at Turf N' Surf Po-Boy. He owns three of them in Austin. This location sits inside the Lavaca Street Bar at the Domain. "The first thing I'm gonna do is the tuna tacos. It's probably the most popular thing we have on the menu. We dress it up with coleslaw, mixed greens, tomatoes, a little purple onion and cilantro ranch," he added. Talk about a winning dish! Next up: blackened-seasoned salmon. One look at him and it's clear – cooking is his passion. But this wasn't always his profession. Gilmore dabbled in everything from auto mechanics to building and selling custom bikes and designing contemporary homes. "Just chasing money, but not really satisfying my dreams," Gilmore explained. He tried it all because he wasn't sure he could make a living cooking. But in the early 2000s, Gilmore sold his business in Houston to come back to Austin to do what he truly loved. "I wanted to do something fresh with seafood and give it that cajun vibe with a twist of Texas," Gilmore said. At Turf N' Surf Po-Boy you can order tacos, salads and plates. Grilled or fried, the menu options are endless. Poboys can come in their traditional bread or whole grain. "East coast calls them hoagies, we call them subs. Louisiana, Mississippi and all around there they call them poboys ." All of Gilmore's restaurants are open weeknights from 11 a.m. until midnight, but on Friday and Saturday, you can catch them until 2 a.m. Gilmore welcomes the crowds. "Cooks love that kind of stuff. It's in our blood. Let's see what we can do. It is kind of like an orchestra because everybody has to work together," said Gilmore. Great food coupled with an inspiring story of following your passion. Because you never know what you are truly meant to do, unless you give it a go. Chef Gilmore's original restaurant is downtown at 405 Lavaca. 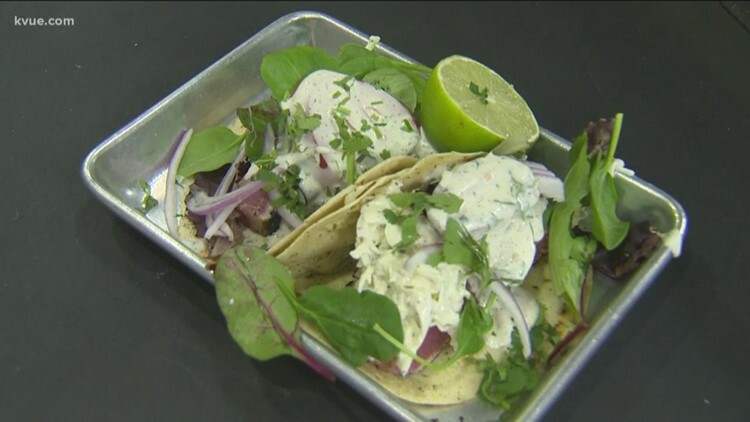 Their second locations is next to the Broken Spoke on South Lamar and the one KVUE visited is at the Domain off Rock Rose at Lavaca Street Bar. They also do breakfast there.